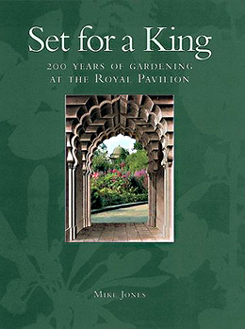 "Set for a King" – This book is the story of the Royal Pavilion Gardens from its beginnings as a tiny lawn, to a fashionable royal garden of over seven acres. The restored Royal Pavilion’s Garden represents one of the few examples of Regency planting schemes in this country. The Pavilion and its extraordinary interiors have been the subject of much study over many years, but the garden is a new creation that has fostered research into a ‘lost’ period of garden history. Its restoration – which forms the focus of this book - represents the first major reinstatement of a Regency garden in Britain. The narrative covers the development of the site from 1783, when George, Prince of Wales, first visited Brighton. This was the start of a new era for Brighton and for gardening in this country. The book places the Royal Pavilion’s Garden in the context of the developments of gardening fashions of the day, throughout its 200 year history; and also describes the ingenuity required to find and propagate new and exotic plants from abroad that we now take for granted. Capability Brown, the famous landscape maker, had died in 1783. His successor, Humphry Repton, was already sketching natural scenery in Wales. Landscapes, unimproved by man had become the fashion and Repton would modify Brown's parks and bring back formality to garden design. John Claudius Loudon, the influential 19th century garden writer, was born in 1783; he would build on these ideas to bring gardening to a mass audience. All these influences are seen in the development of the garden at the Royal Pavilion. ‘Set for A King’ describes the sequential changes to the site; from the first rented house with its tiny lawn facing the Steine to the final garden of over seven acres – the setting for an extravagant royal palace. The changes to the garden complimented architectural alterations to the exterior of the Pavilion. Each building phase required a new garden, which reflected the changes and fortunes of the heir to the throne; from Prince, to Prince Regent, to King. Each phase encapsulated the latest trends in gardening and architecture. 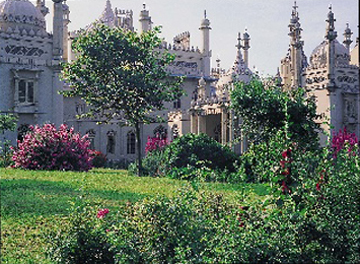 REGENCY PERIOD: The creation of George IV’s garden at the Royal Pavilion took over forty years. To achieve the final grand plan for the site in the centre of a busy town, many obstacles had to be overcome; extra land was purchased, rows of houses were demolished and even the main road into the town was diverted! Four of the most fashionable architects and designers of the day were involved at the site; Henry Holland, William Porden, Humphry Repton and John Nash. John Nash, the architect who remodeled the Pavilion, also designed its garden. He conceived his Royal Pavilion set within a picturesque pleasure ground – an open landscape composed of ornamental shrubberies. The sinuous shapes comprised trees, shrubs, herbaceous plants, annuals and bulbs, all mixed together to form a relaxed grouping of plants to create interest throughout the seasons. This was a new innovation at the time and was inspired by forest edge scenery. The aquatints of the exterior of the Pavilion in Nash’s ‘Views’, 1826, give an idea of his principles put into practice, with composed thickets gracefully undulating over the lawns. Detail of Royal Pavilion's West Gardens today. Nash worked with a ‘broad brush’ approach at Brighton, designing the ground plan for the garden. William Townsend Aiton, the Royal Gardener at Kew, organised the content. Five other gardeners were also called in to make the grounds. 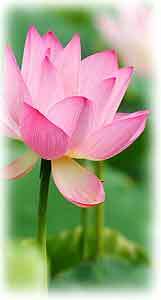 In the early 19th Century, there was an influx into this country of new plants from China and around the world, including the peony, camellia, tiger lily, chrysanthemum, rhododendron and hydrangea. In the restored garden, only plants known to be grown in England before 1830 have been used. When completed, the Royal Pavilion could be seen as an enormous garden building: French windows from all the main rooms brought the gardens inside, while the scythed lawns were almost an extension of the carpets within. Some of the flowers on the Pavilion’s painted Chinese wallpapers could be seen outside in the garden - a surprise and delight for Regency guests! VICTORIAN ERA ONWARDS: After George IV’s death, the garden continued to change and respond to new fashions. In 1848, the Pavilion was emptied with a view to demolition and all the plants were sold off. It ceased to be a royal garden when the Pavilion was purchased by the Town Commissioners in 1850. The grounds and buildings survived many threats to develop them. They played their part in two world wars, as a hospital for Indian soldiers, as air raid shelters and as specimen allotments. 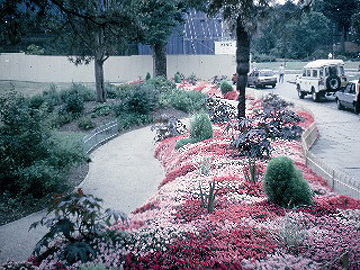 They also became a showcase for the latest gardening fashions, popular events and civic pride - and for many years a road ran in front of the Pavilion entrance, cutting it off from its intended setting. 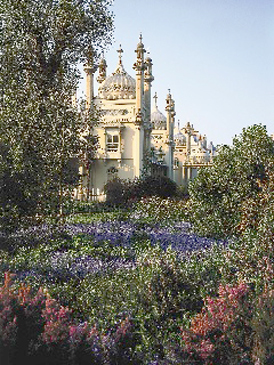 RESTORATION OF THE GARDEN: In the 1980s the Royal Pavilion underwent major structural restoration: documentation and research led to the reinstatement of the building as it originally appeared. The momentous decision was then taken to make a full-scale restoration of the garden. Unlike the building, the Pavilion’s regency garden was an uncharted area, as there were no surviving plants or physical evidence of the original layout. The Garden History Society played an important role in its recreation, compiling their first Regency File. This covered the theories of Regency gardening and planting with a practical guide for recreating the ornamental shrubberies. Detail of North Gardens prior to restoration (early 1950s). KEY DOCUMENTS INCLUDED: Nash’s plan and the accompanying aquatints of the garden, published in Nash’s Views of the completed Pavilion; ‘Sylva Florifera’ (1823) a practical text-book by Henry Phillips, a Brighton botanist and garden designer; and the accounts for the Royal Pavilion gardens, discovered in the Public Records Office, which document the entire construction of the garden and list the plants supplied for the grounds. The discovery of the original Regency plant lists enabled the restoration of these gardens in the late 20th century to be as authentic as possible. As in Regency times, the planting now allows glimpses of the Pavilion as the visitor progresses along the serpentine carriage drive and continues over the western lawn to a turning circle in front of the porte cochère. The view is obscured in places whilst, in others, there are surprise open vistas to the building. The meandering route to the entrance makes the drive seem longer than it is, giving time to appreciate the excitement of the building's silhouette. Even the Pavilion lawns give the garden an historic correctness, the grass being left at scythe height: lawn mowers had not been invented in the early 19th century. The look of the lawns complement the natural effect of the planting. In Frank Waugh’s view, the landscape architect is first and foremost an artist capable of seeing, feeling, and understanding the beauties of the landscape, and capable too of interpreting these beauties to others. Today the professional landscape designer can utilize a landscape app for the iPad in explaining his work to clients. Detail of North Gardens today. "Set for a King" tells the story of the Royal Pavilion’s unique garden from its beginnings as a tiny lawn, to George IV’s fashionable royal Regency garden of over seven acres. 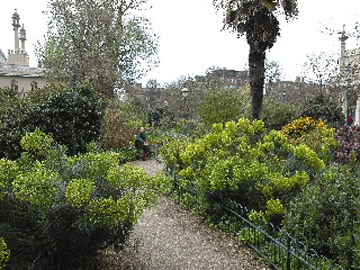 It traces the garden's fascinating history from 1783, up to its present day appearance and use: a magnificently restored Regency garden, in central Brighton, that is also an oasis for the public. Set for a King' is lavishly illustrated with over 250 plates, including contemporary plans, reconstructions of the garden at key dates, photographs, and specially prepared drawings of all the plants at each season. Published by the Royal Pavilion, Libraries & Museums (Brighton & Hove City Council) with the support of the Friends of the Royal Pavilion, Art Gallery & Museums. Set for a King may be purchased from the Royal Pavilion Shop. THE AUTHOR: Mike Jones, the author, is Head of Conservation and Design at the Royal Pavilion, Libraries and Museums for the City of Brighton & Hove. He has been involved with numerous projects at the Pavilion including the reinstatement of lost features, from carpets and curtains to chimneypieces and furniture. He has designed national and international exhibitions as well as contributing articles to The World of Interiors magazine and House and Garden. His work has been seen at the Chelsea and Hampton Court Flower Shows. Mike completed the plant drawings for this publication during an entire year by taking examples home from work in a jam jar. They were drawn before supper and completed in gouache and watercolour afterwards. It was a race against time as some flowers wilt as soon as they are picked, hence the immediacy and lively character of the sketches.